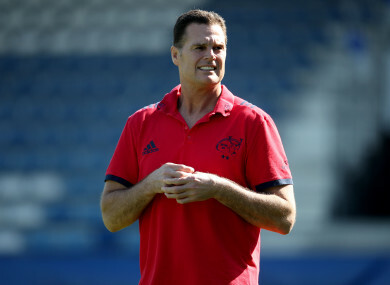 RASSIE ERASMUS SAYS he will remain with Munster as long as he is needed by CEO Garrett Fitzgerald and IRFU director David Nucifora. Since confirming that he will leave the role later this season, the Munster director of rugby has consistently given assurances that he will oversee a handover between him and a new head coach. “The only people that can give that answer is Garrett (Fitzgerald) and David Nucifora. There are 60 million people in South Africa and if everybody on that side’s opinion is asked you will get a lot of different opinions. Now we know Johann van Graan is the new coach and once he and Munster are comfortable then I will leave. If that happens before 1 November then I will leave but I’ll definitely stay to welcome the new coach and help until he takes the reigns. With Munster back in Champions Cup action against Leicester Tigers in December, it seems an Erasmus exit before then would leave Van Graan on a very steep learning curve before taking over. Again though, Erasmus was keen to issue a wait-and-see notice. Email “Rassie offers assurance that he'll work on as long as Munster need him”. Feedback on “Rassie offers assurance that he'll work on as long as Munster need him”.